Galungan is one of the most sacred of the Balinese holy days. The large Bamboo pole is erected in front of every home with intricate decorations and sculpting. All is made by hand and our four Jiwa Damai youngsters were very happy and content to produce this beautiful Penjor. They worked together to cut the huge bamboo pole as well as cutting and carving with the knife the intricate decorations. 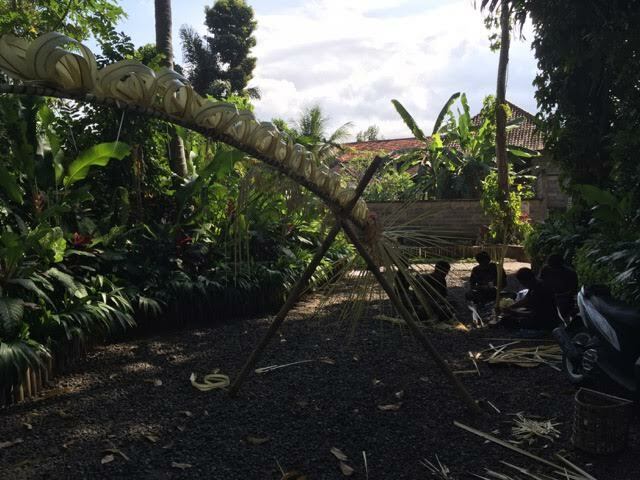 For this years Galungan Celebration our head gardener Ketut built together with two of our volunteers the panjor which is erected at the entrance gate to Jiwa Damai. A huge Bamboo is cut and then decorate with all details along the stem and the top. A little alter is created to give offerings to the gods. The panjor remains put for 3 weeks and looks very wonderful. Tradition demands, that each house in the village places one in front of their entrance. The Penjor is a traditional Balinese decoration made for the Galungan festival. Galungan is a traditional Balinese celebration, similar to a Western Christmas, where families get together.The Penjor is usually made by the head of the family, and it takes a whole day for the family to put it together. It is then erected outside each family compound. The Penjor is made and assembled then it is erected in front of the house / compound.